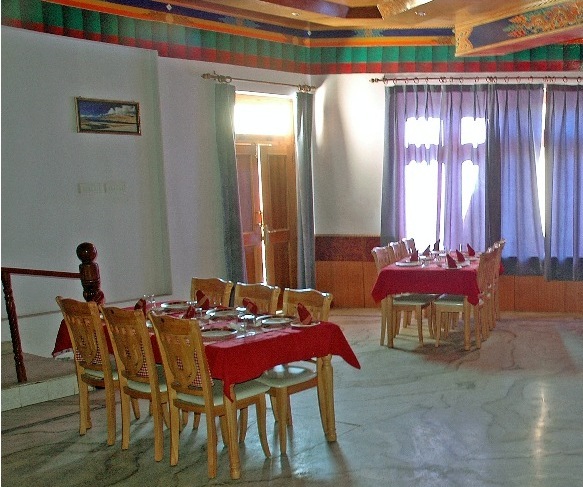 The hotel is situated in the Skara area of lower Leh approximately 1-2 km from Leh airport and 2-3 km from Leh market. The hotel is surrounded by colorful Himalayan Mountains offering spectacular views of the peaks of Stok range and lush green fields of the locality. Another feature of the hotel is the peaceful location of Skara area, away from the hustle bustle of Leh market providing relaxing and rejuvenating stay to make your holiday memorable. Coffee Shop/Cafe, Internet/Wi-Fi, Backup Generator, Gym, Bar, Health Club, Room Service, Business Facilities, Restaurant, Laundry Facilities. Television Room, Cable/Satellite TV, Internet Access, Telephone, Complimentary Newspaper, Desk, Complimentary Toiletries, Makeup/Shaving Mirror, Air Conditioning Room, House Keeping. Business Facilities, Coffee Shop/Cafe, Laundry Facilities, Restaurant, Room Service, Bar. User reviews for "Cho Palace Hotel Leh"